Each week, we compare all 32 NFL teams using our Football Relativity comparison. On the comparison, the 10 level is reserved for the best teams, and the 1 level for the worst. We’ll note throughout where teams have moved up or down from last week. Also, next week we will shift the comparison to focus on just the 12 playoff teams. 10 – Green Bay Packers – Green Bay bounced back from its first loss of the season with a convincing Christmas night win over the Bears. The blowout serves as a reminder that the Packers are the class of the league, after a week full of noise based on their worst performance of the season. 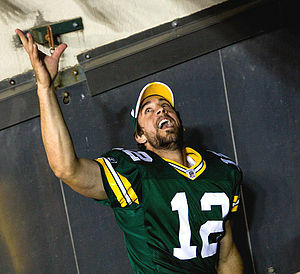 Green Bay also claimed home-field advantage throughout the playoffs with the win. 9 – Baltimore Ravens, New England Patriots, New Orleans Saints, Pittsburgh Steelers – These four teams have serious shots to beat the Packers, although they wouldn’t be favored. We like the Ravens and Saints the best of this bunch, because at their best they are most dangerous. Baltimore can’t afford a let-down during the playoffs like they had in the regular season; clinching a bye next week would help. The Saints need to take a lead, because when they do they are deadly. Again, a bye would help avoid a trip to San Francisco that could be problematic. The Steelers will likely have to go to the wild-card route, which they have done before, but it seems like a longer shock this year because of Ben Roethlisberger’s health. The Patriots clinched a bye and still can land home-field advantage, but their defense raises too many questions. 8 – Atlanta Falcons, Detroit Lions (UP A LEVEL), San Francisco 49ers – The 49ers got another win and still can land a bye, but while we can see them winning a playoff game at home, we don’t expect them to go to Green Bay and come out victorious. The Lions blasted the Chargers. They will be the most dangerous wild-card team in the NFC and maybe in the entire league. Explosiveness is scary, and the Lions have that offensively. The Falcons once again showed that while they are consistent, they aren’t dynamic enough to win playoff games. 7 – Cincinnati Bengals (UP A LEVEL), Dallas Cowboys, Denver Broncos, Houston Texans (DOWN TWO LEVELS), New York Jets (DOWN A LEVEL), New York Giants (UP A LEVEL), Philadelphia Eagles (UP A LEVEL) – The Bengals took control of the race for the AFC wild-card spot with a win and a Jets loss. Cincinnati hasn’t beaten any elite teams, but credit to them for not losing any upsets either. The Jets lost to the Giants and seem to have a mess of problems. But they have had such problems before and still made playoff runs. If they make it in, you can’t completely count them out. The Cowboys and Giants will face off for the NFC East title. Neither team is great, but both have ceilings that can scare opponents. The Giants especially raise questions, because of the way they rose to the occasion against the Patriots and Packers this year. We’re writing off the Texans at this point. T.J. Yates can’t get the ball downfield, and as a result the offense isn’t scary enough. We don’t think even Andre Johnson can make a big enough difference. The Broncos fell apart in Buffalo and must show that their defense isn’t cracking. But with a win, they’re in. The Eagles are eliminated but are finally playing at a playoff level. 6 – Oakland Raiders, San Diego Chargers (DOWN A LEVEL), Tennessee Titans – The Raiders stayed alive with an overtime win against the Chiefs. But even if they make the playoffs, the Raiders are not a major threat to win in the postseason. The Chargers lost their momentum in Detroit and fell out of the playoff picture. The sum never equalled the parts in San Diego this year, and it wasn’t all Philip Rivers’ fault. The Titans stayed in the playoff picture with a win over the Jaguars, but playoff berth or no they aren’t serious threats. 5 – Arizona Cardinals, Carolina Panthers (UP A LEVEL), Chicago Bears, Seattle Seahawks – The Cardinals and Seahawks fell below .500, but both teams had game efforts. The Cardinals lost in Cincinnati, while Seattle couldn’t hold off the 49ers at home. Both teams have improved during the season to the point where they are at least competitive. The Bears fell apart after losing Jay Cutler and Matt Forte, but the talent across the board still merits mid-level placement in the comparison. The Panthers are streaking at the end of the season and have tons of reasons for hope for 2012. They need to add pieces defensively, but Cam Newton is the real deal. 4 – Buffalo Bills (UP A LEVEL), Miami Dolphins – The Bills finally broke a long losing streak by blowing out the Bills. The Dolphins fell after taking a 17-point lead against the Patriots. Both teams have been competitive, at least in stretches, but both need more help in order to make a run at the playoffs in 2012. 3 – Cleveland Browns, Jacksonville Jaguars, Washington Redskins (DOWN A LEVEL) – The Redskins had some momentum but fell apart against the Vikings last week. It’ll be interesting to see who Washington rates as keepers and who the Redskins reject. The Browns have some nice pieces on defense but need a huge upgrade offensively if they are going to compete in 2012. The Jaguars also will need to figure out who to keep defensively as they address several huge issues. 2 – Indianapolis Colts (UP A LEVEL), Minnesota Vikings – The Colts have built something the last couple of weeks. Dan Orlovsky has probably earned another job as a backup quarterback somewhere, and some of the defensive pieces have demonstrated value as well. The Vikings got a win in Washington, and Joe Webb is forcing himself into the quarterback of the future conversation. 1 – St. Louis Rams, Tampa Bay Buccaneers (DOWN A LEVEL) – Both the Rams and Bucs looked like ascendant teams at the end of last season,but this year they have completely fallen apart. Tampa Bay has lost nine straight, while the Rams could end up with the No. 1 overall pick for the second time in three years. Each year, we compare the significance of in-season trades in a Football Relativity post. In this comparison, the 10 level marks the most significant trades, and the 1 level the least significant. This post compares all trades through the Oct. 18 trade deadline. 10 – Bengals trade QB Carson Palmer to Raiders for first-round pick in 2012 and second-round pick in 2013 that can become first-rounder – Palmer had not played in 2011 after he told the Bengals he wanted to be traded. Notoriously stubborn Bengals owner/GM Mike Brown called Palmer’s bluff, letting him sit out without much hope of a silver (or even silver and black) lining. In the meantime, Cincinnati drafted QB Andy Dalton and made him their starter. Dalton got off to a good start as the Bengals opened 4-2, and that might have softened Brown a little. Then the Raiders – who lost QB Jason Campbell to a broken collarbone that’s at least a six-week injury – made a move for Palmer and paid a huge price to add him. The Bengals, who had once turned down two first-rounders for WR Chad Ochocinco, this time made the deal. They get Oakland’s first-rounder next season and a second-rounder in 2013 that can become a first-rounder if the Raiders make the AFC Championship game in either of the next two years. The Raiders, who now lack picks in each of the first four rounds of the 2012 draft, believe Palmer still has the big arm to maximize their young, talented group of wideouts. Head coach Hue Jackson, who coached Palmer during some of his best Bengals years, runs an offense that Palmer knows, which should aid the adjustment period. And Palmer has been working out as well. It’s a risky move for the Raiders, but Palmer does give them more upside than Campbell ever did. The question is whether Palmer can adjust to the silver and black quickly enough to lead the 4-2 Raiders to the playoffs. The price is incredibly steep, but the Raiders are so desperate to win that “just win, baby” is trumping long-term thinking right now. 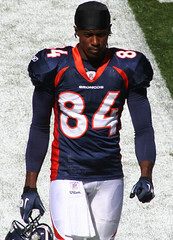 6 – Broncos trade WR Brandon Lloyd to Rams for 2012 sixth-round pick that could become a fifth-round pick – The Broncos, clearly in a rebuilding mode, dealt their leading receiver Lloyd to the Rams. With Denver moving to Tim Tebow as their starting quarterback, it makes sense to have him work with the receivers who will be around beyond 2011, such as Eric Decker and Demaryius Thomas, who is returning from injury to make his 2011 debut. Since Lloyd is a free-agent-to-be, he became expendable. But Denver didn’t get a great price – just a sixth-round pick that becomes a fifth-rounder if Lloyd catches 30 passes for the Rams. But the deal at least opens opportunities for Thomas, which is a legitimate developmental move for Denver. The Rams, who gambled and lost on a one-year deal for Mike Sims-Walker to be their No. 1 receiver this year, get Lloyd, who thrived under offensive coordinator Josh McDaniels in Denver. (Sims-Walker was released to clear a spot for Lloyd.) Since McDaniels is the only coach to unlock Lloyd’s potential over nine years with four teams, Lloyd couldn’t have found a better landing spot. He’s immediately the best receiver the Rams have, and he has the chance to finish the season strongly to earn a new contract, be it in St. Louis or elsewhere. The Rams are 0-5, so this isn’t a move for the playoffs, but it does allow QB Sam Bradford to keep developing and should help the offense move from awful closer to average. If Lloyd fits as the situation suggests, expect the Rams to extend his deal, to make the most of the draft pick they spent to get him. 4 – Seahawks trade OLB Aaron Curry to Raiders for 2012 seventh-round pick and conditional 2013 fifth-round pick – We discussed Curry’s ups and downs in this post, which focused on trade rumors about him. Seattle finally gave up on Curry, the former fourth overall pick in the draft, even though their linebacker corps has been wracked by injuries. With Curry gone, rookie K.D. Williams emerges as a starter in Seattle. In Oakland, Curry provides some flexibility at linebacker and allows Kamerion Wimbley to move up to defensive end in pass-rushing situations. Curry is the kind of first-round disappointment that Al Davis loved to take a chance on. Given the price, you can’t blame the Raiders for taking a shot on Curry to see if they can unlock his potential in a way Seattle could not. The fact that Curry started his first game as a Raider only shows the potential impact of this deal. 3 – Eagles trade RB Ronnie Brown to Lions for RB Jerome Harrison and conditional seventh-round pick in 2013 – With Jahvid Best battling concussion issues and rookie Mikel Leshoure sidelined for the year, the Lions added insurance in Brown. The longtime Dolphin had a slow start for the Eagles, running just 13 times for 38 yards and turning the ball over on one key Wildcat-type of play. Brown isn’t what he once was, but he’s sturdy and dependable enough to fill a lineup spot and protect QB Matthew Stafford if Best misses time. The Eagles basically gave Brown away, getting only a conditional seventh-rounder as well as Harrison, whom they traded for last season and then let leave in the offseason without a second thought. This trade was voided when Harrison failed a physical with the Eagles. 1 – Jets trade WR Derrick Mason to Texans for conditional seventh-round pick – Mason was supposed to come to the Jets to be the dependable third receiver, replacing the departed Jerricho Cotchery. But instead of living up to his two-year contract, Mason had just 13 catches for 115 yards for the Jets. More importantly, the Jets coaching staff and front office identified Mason as a troublemaker in the locker room. That had never been Mason’s reputation before, but things quickly devolved to the point that the Jets basically gave Mason away. In his place, the Jets will go to rookie Jeremy Kerley as their third receiver. The Texans, who are without Andre Johnson at the moment, and Mason provides stability and reliability than guys like David Anderson (who was again released) or the inconsistent Jacoby Jones. Now, with Mason and Kevin Walter, the Texans can at least give QB Matt Schaub some options. And if Mason ends up with less than 33 catches as a Texan, Houston won’t owe the Jets a pick. If he does have that many catches, he’ll be well worth a seventh-rounder. The price was right for Houston, and Mason is likely thrilled to escape a situation where he wasn’t wanted. The NFL trade market heated up this week with two players changing addresses. Below, we talk about the moves of WR Derrick Mason from the Jets to the Texans and OLB Aaron Curry from the Seahawks to the Raiders. We’ll compare these trades along with any others during the NFL season in a future post. Jets trade WR Derrick Mason to Texans for conditional seventh-round pick – Mason was supposed to come to the Jets to be the dependable third receiver, replacing the departed Jerricho Cotchery. But instead of living up to his two-year contract, Mason had just 13 catches for 115 yards for the Jets. More importantly, the Jets coaching staff and front office identified Mason as a troublemaker in the locker room. That had never been Mason’s reputation before, but things quickly devolved to the point that the Jets basically gave Mason away. In his place, the Jets will go to rookie Jeremy Kerley as their third receiver. The Texans, who are without Andre Johnson at the moment, and Mason provides stability and reliability than guys like David Anderson (who was again released) or the inconsistent Jacoby Jones. Now, with Mason and Kevin Walter, the Texans can at least give QB Matt Schaub some options. The price was right for Houston, and Mason is likely thrilled to escape a situation where he wasn’t wanted. Seahawks trade OLB Aaron Curry to Raiders for 2012 seventh-round pick and conditional 2013 fifth-round pick – We discussed Curry’s ups and downs in this post, which focused on trade rumors about him. Seattle finally gave up on Curry, the former fourth overall pick in the draft, even though their linebacker corps has been wracked by injuries. With Curry gone, rookie K.D. Williams emerges as a starter in Seattle. In Oakland, Curry provides some flexibility at linebacker and allows Kamerion Wimbley to move up to defensive end in pass-rushing situations. Curry is the kind of first-round disappointment that Al Davis loved to take a chance on. Given the price, you can’t blame the Raiders for taking a shot on Curry to see if they can unlock his potential in a way Seattle could not. Of these 17 receivers, we knocked out six – Monk, whose peak began before the era began, and five players who weren’t among the top 30 in receptions, yards, and touchdowns – Derrick Mason, Keenan McCardell, Jimmy Smith, Muhsin Muhammad, Rod Smith. We then added in four others – Reggie Wayne, Larry Fitzgerald, and Andre Johnson, who don’t meet the numbers thresholds yet but should soon; and Michael Irvin, who has made the Hall of Fame. So we set out to compare Owens to the other receivers of his era. Hall of Fame level: Jerry Rice, Randy Moss, Terrell Owens, Cris Carter, Hines Ward, Michael Irvin, Marvin Harrison – We prefer Moss to Owens slightly, since Moss was the more dynamic threat, but both belong in the Hall. So does Carter, who may finally get over the hump now that Shannon Sharpe has gotten in to ease the receiver backlog. Ward has moved into the Hall of Fame level in the last few years as the leading receiver in the Steelers’ Super Bowl run; if Irvin is in, Ward should be in too. They’re equals. Harrison is an interesting case; his numbers say he’s in, but was he a really good player with a great quarterback, or a great player in his own right. Current players: We’d also put Larry Fitzgerald and Andre Johnson in this level at this point in their careers. They need to continue adding to their accomplishments, but they’re on track to get in. Reggie Wayne strikes us as a 50/50 case right now; could he eventually pass Harrison in line? Just outside the HOF bubble: Tim Brown, Andre Reed, Torry Holt, Isaac Bruce, Art Monk, Irving Fryar – Brown’s numbers are great, but he strikes us as a really good player who compiled great numbers. Bruce and Holt played in a WR-friendly system with the Rams; how could you choose between them for the Hall? Reed falls short, and we believe Monk should have as well. But if any of these players made the Hall of Fame, it wouldn’t be a travesty. We were shocked Fryar hit the numbers standards, but he did so just barely. He’s a level below the rest of the bubble guys. Current players: Derrick Mason, Chad Ochocinco, Donald Driver, Anquan Boldin, Steve Smith, and Santana Moss have gaudy numbers but fall below the bubble as well. We don’t see any of this group crossing the HOF threshold. Just missed the numbers thresholds: Keenan McCardell, Jimmy Smith, Muhsin Muhammad, Rod Smith – These guys were good but not great. They may be Hall of Fame finalists, but they won’t find their way in. This may be the last week of NFL transactions for a long, long time. And as teams and players prepare for a potential lockout, a few deals are being made. So today and tomorrow, we’re going to look at these moves and their impact on the field in 2011. Today, we start with the last signings; tomorrow, we’ll look at salary-cap clearing cuts. Saints add DT Shaun Rogers, keep RB Pierre Thomas – Rogers, who was released by the Browns last month, can still be a disruptive force inside. So you can see why the Saints wanted him in the middle of their defense. Rogers got a $4 million contract (reportedly $2 million less than he was offered elsewhere), which is pretty good money but reasonable for a starter. But it’s a good deal for the Saints, for two reasons. One, not many guys are available because of CBA limbo, and Rogers is clearly the best defensive lineman available at this point. And getting Rogers on a one-year deal should ensure that he stays motivated and focused throughout the season, since the carrot of another payday is out there. Give the Saints credit for anteing up and making a deal while they can. Thomas got a four-year, $12 million deal to remain in New Orleans after a rather contentious contract squabble throughout 2010. The deal is worth it to the Saints because they saw how their offense fell off when Thomas’ solid if unspectacular production wasn’t in the lineup in 2010 due to injury. Chargers add S Bob Sanders – When healthy, Sanders is a premier in-the-box safety who hits like a ton of bricks and makes plays as a tackler, blitzer, and coverman. But Sanders has been healthy far too infrequently in the past three years, which led the Colts to cut their losses on the former defensive player of the year. But the Chargers were more than happy to take a one-year shot on Sanders, hoping to catch lightning in a bottle (or on the helmet?) and get a premium player for cheap. For a defense with far too few impact plays last year, it’s a good gamble. But Chargers fans should remember Sanders’ health problems just as much as they remember his highlight film. Patriots add NT Marcus Stroud – Stroud, who had been released by Buffalo, moves within the AFC East to the Patriots. New England hopes that, like Gerard Warren last year, Stroud can provide sturdy play in a limited role. If he can do so, it will allow the Pats to use standout Vince Wilfork as a 3-4 defensive end in addition to a nose tackle, which makes the Pats defense more dangerous and more versatile. So for a contending team like the Patriots, giving Stroud a two-year deal to play a specific role makes sense. Redskins add S O.J. Atogwe – The Redskins love to make a free-agency splash, but with the lockout looming, the pool of players was limited. Still, they spent big money on Atogwe, the turnover-causing machine from the Rams. Atogwe could combine with LaRon Landry, who had a breakout season in 2010, to provide an elite safety pair, and Atogwe’s ability in coverage makes him a nice compliment to Landry, who’s at his best in the box. Plus, Atogwe played some of his best ball in St. Louis under current Redskins defensive coordinator Jim Haslett. But the five-year, $26 million deal is miles beyond any other deal on this list, and it makes you wonder if this is a savvy move or an overreaching headline grab by the Skins. 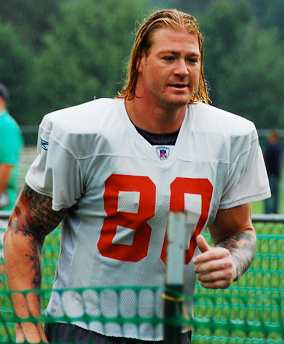 Panthers add TE Jeremy Shockey – Shockey was released by the Saints after an injury-plagued tenure there, and now he lands with the division-rival Panthers on a one-year deal. His former University of Miami tight ends coach Rob Chudzinksi is the new offensive coordinator in Carolina, so there will be some familiarity for him there. Shockey is still a good (not great, but good) receiver, and if he can stay healthy he’ll add an element to the Panthers’ offense that hasn’t been there in a while. Texans keep TE Owen Daniels – Daniels, who was miffed to get a restricted free-agent tender instead of a long-term deal last season, was paid off for his patience this year with a four-year deal worth up to $22 million with $13 million in guarantees. It rightfully pays Daniels as a top-10 tight end, which he has proven to be. Daniels’ receiving ability adds an important dimension to the Texans’ offense, and now that he’s healthy, it should help Matt Schaub and Andre Johnson find a few more openings for big plays. Seahawks keep RB Leon Washington – Washington, whom the Seahawks acquired in a draft-day trade last offseason, got a four-year, $12.5 million deal with another $3.5 million in incentives. That’s a nice payday that Washington has been seeking for several years. Washington is an elite returner – he practically won a game against the Chargers by himself with two kickoff return touchdowns last year – and he is also a dangerous third-down back. The price may be steep, but Washington adds value in his role. Bills keep OT Mansfield Wrotto and S George Wilson – Wrotto, whom the Bills signed off the scrap heap at midseason last year, ended up starting seven games for the Bills, earning a callback for 2011. Wilson serves as Buffalo’s special-teams captain and also has started some games at safety. Giants keep RB Danny Ware – Ware, who has been the Giants’ third-string back the past couple of years, returns to provide depth. That’s important considering that Brandon Jacobs is likely on the outs and Ahmad Bradshaw is a free agent. Each week, we focus on one game and share our thoughts on it, both from an on-field perspective and a fantasy football perspective. This week, we focus on the topsy-turvy contest between the Cincinnati Bengals and the Atlanta Falcons, which the Falcons won 39-32. It’s hard to know how good these teams are after such a strange game. Atlanta took a 24-3 halftime lead in a dominating first 30 minutes, but Cincinnati used big plays to score 22 unanswered points in the third quarter to take the lead. But the Falcons responded with two big drives to score 14 fourth-quarter points to put the game away. Atlanta is now 5-2 and at the top of the NFC standings, while the Bengals fall to 2-5 and are three games behind the Ravens and three and a half behind the Steelers in the AFC North. 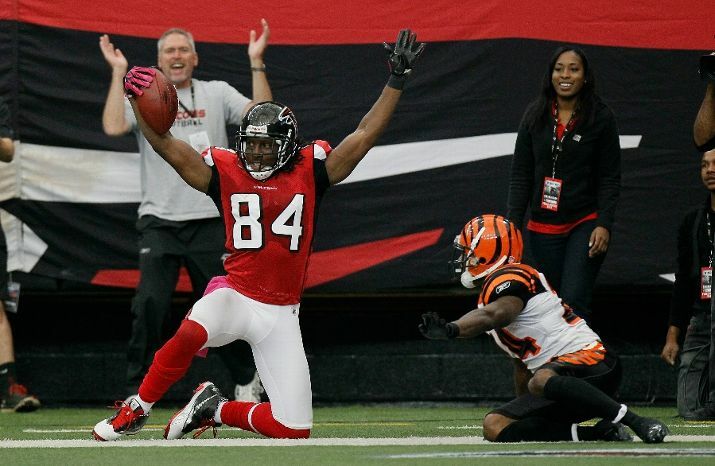 *Roddy White (pictured) showed in this game why he is a true No. 1 receiver in this league. Even though he’s the Falcons’ only real outside threat, he still caught 11 passes for 201 yards and two touchdowns, with a two-point conversion catch thrown in for good measure. White doesn’t get the publicity that other receivers get, but he’s just as important to the Falcons as guys like Andre Johnson or Calvin Johnson are to their teams. After a slow start to his career, White has developed into an elite player. *While White proved once again in this game that’s he’s elite, there are still questions about whether Matt Ryan is at that same blue-chip level. Ryan showed good patience in the pocket against the Bengals, and he completed 24-of-33 passes for 299 yards, so in this game he showed his talent. But Ryan has always been better at home than on the road, and until he can take his show out of the dome, he’s not near the top-flight level of others at his position. *Rookie Jordan Shipley, now that he’s healthy, is a terrific inside threat to complement Ochocinco and T.O. Shipley broke free for a 64-yard touchdown in the Bengals’ third-quarter explosion, showing great speed in the process. As he develops, he’s going to be tough for safeties to cover inside, and he could turn into a Wes Welker-esque threat. *The Falcons defense gave up 32 points (although seven came from the Bengals D), but one underrated player impressed – DT Vance Walker. Last year, watching Falcons games unveiled Kroy Biermann to Football Relativity readers, and now we want to pump up Walker, a second-year man out of Georgia Tech. He had five tackles in this game, including one tackle for loss and another stuff of Cedric Benson. Walker’s development inside gives the Falcons another front-four threat. *The strength of the Bengals’ defense is the secondary, and even though they let White go crazy in this game, Cincy still had two terrific plays. Leon Hall made a leaping interception of Ryan pass to set up Shipley’s touchdown, and on the next possession Adam (Don’t call me Pacman) Jones stripped White and returned the fumble 59 yards for a touchdown. Still, the consistency was lacking in covering White, and that ended up being a huge reason the Bengals fell to 2-5. *While White is an elite receiver and a no-doubt No. 1 fantasy receiver, no one else in the Falcons’ passing game is a starter. That includes TE Tony Gonzalez, who had just two catches in the game and was rarely targeted. There are better under-the-radar tight end options to start now than Gonzalez despite his name value. *It’s hard for fantasy owners to make the call about who’s better, Owens or Ochocinco. Both players produced this week, and there’s always the chance for that to happen, especially if the Bengals fall behind. Both players fall into the second dozen of fantasy receivers. *Both Michael Turner and Cedric Benson ran for more than 100 yards in this game, and both remain solid every-week fantasy starters.